Our luxurious handmade cold process goats milk soap has a rich, creamy lather since our soap formulation is enriched with real goats milk, together with olive oil, coconut oil, palm oil, cocoa and shea butters. Goats milk soap is highly moisturising, and we've created a handmade soap with a rich creamy lather that remains hard so it lasts and lasts. 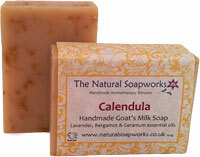 We manufacture to our cold processed goats milk soap to own unique recipe, using traditional wooden soaps moulds. The soap is cured for at least 4-6 weeks, before being hand trimmed and cut into bars that weigh at least 100g. Our handmade soaps are naturally coloured using natural clays, spices, and infused botanicals. Many are intricately swirled, to create unique and beautiful soap bars. Visitors to our little shop are usually amazed by how our handmade goats milk soap makes their skin noticably softer after just one wash! We only use aromatherapy grade essential oils to ensure our soaps are very gentle, so are suitable for use on sensitive or troubled skins. 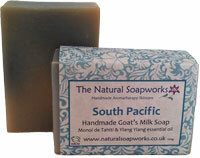 Visit our Goats Milk Soap page for more information on why goats milk soap is so special. 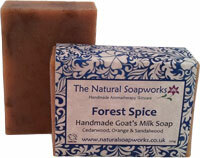 This is a pure unscented goats milk soap which is free from any fragrance or colouring. This is a very gentle, creamy soap which lathers just like our other scented soaps, but is particularly suited to very sensitive skin types. This is good choice for anyone with sensitive or troubled skin conditions since it is a delicate soothing bar, beautifully pattened with golden calendula petals. 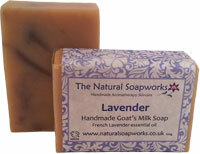 The fragrance is subtle with lavender, bergamot and chamomile essential oils. We tend to find that many people begin using our soaps by selecting this bar. Then, once they find it doesn't upset their skin they move onto to other soaps within the range! 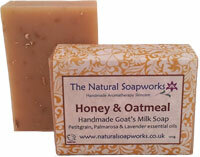 This is a very gentle bar enriched with skin soothing oatmeal and honey. Honey and Oatmeal is one of our most popular soaps, with a subtle aroma that includes lavender, petitgrain and chamomile essential oils - carefully blended by our Aromatherapist into a synergy that supports troubled skin conditions. This makes Honey and Oatmeal a particularly good choice for anyone who has sensitive or troubled skin including eczema or psoriasis. This is a lovely traditional lavender soap, and each bar has been swirled into an intricate purple/lilac pattern using a naturally infused alkanet oil. These bars are coloured by hand, so each bar will be different. This is a delicately sweet bar, fragranced with geranium and palmarosa essential oils. 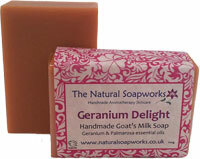 We called it Geranium Delight since it smells similar to turkish delight! It's pale pink in colour since we've added some pink clay to naturally colour each bar. This one is a good choice if you like rosy smells. 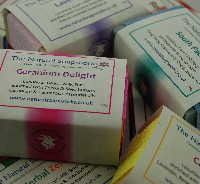 This soap has been developed for the many customers who have asked us for an anti-bacterial soap. It contains natural tea tree and eucalyptus smithii essential oils which both have very strong anti-bacterial qualities. Not surprisingly this gives it quite a strong, fresh fragrance but despite the aroma these are skin-kind essential oils which can be used on sensitive skin types. Coloured with green clay against a pretty blue background. We always think this bar is so reminiscent of the aroma of the 1960's. 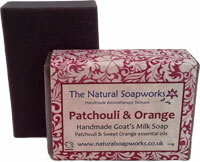 We've used smoky, spicy patchouli and softened with uplifting sweet orange. This bar is a purple colour due to the addition of the natural alkanet colouring - but the depth of colour does vary in each batch. Our popular woody goats milk shaving soap is back again. This variety has a rich woody fragrance from a blend of cedarwood, vertiver and sweet orange. This goats milk soap makes the perfect shaving soap for male customers since we've also added some rhassoul clay (this is the clay that's usually used in expensive spa treatments) which helps the razor to glide over the skin reducing razor burn. Another top selling goats milk soap, this is a beautifully sweet bar, fragranced with an exotic blend of essential oils including Ylang Ylang and Rosewood sharpened with a hint of Lime. This soap is special since it also contains exotic Monoi de Tahiti oil which adds a heavenly fragrance and makes the lather even richer and more luxurious than normal. The bar is naturally coloured with swirled blue patterns. Serene is a popular variety, for anyone who loves sweet aromas. This goats milk soap has a complex aromatherapy blend of exotic essential oils including ylang ylang, rosewood and patchouli. It's a synergy of sweetness with spices and is patterned with hibiscus and natural spices, so it smells delicious and also offers a slightly exfoliating texture too. 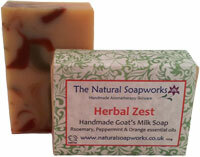 Herbal Zest remains one of our prettiest and most popular bars, appealing to both sexes for it's uplifting herbal aroma. It's a double swirled soap, with a red and green pattern running throughout each bar against a creamy background. The fragrance is a lovely aromatherapy synergy of herby rosemany with fresh peppermint, softened with uplifting sweet orange. It's another good choice for shaving. This is a bright, zesty bar that's perfect for waking you up in the morning! It contains a blend of essential oils including lemongrass, lemon eucalyptus and ginger. Naturally coloured with infused botanical oils. We do not recommend this soap, if you have very sensitive skin. This is a updated version of our Herb Garden soap, designed for gardeners to help with cleaning the fingers after working in the garden. It contains pumice stone to help with gently scrubbing the skin and has a herby fragrance that includes bright peppermint and rosemary with lavender, coloured with natural dill. 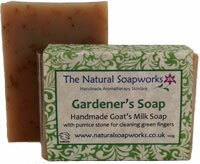 Now available on the Natroma website, and you can mix and match with our Natroma organic goats milk soap varieties too.